In an era where heroism is measured by the number of action scenes by the hero and the thudding noise of the villains henchmen falling like bricks, Vineeth Srinivasan has ventured into a family drama with an element of adventure in the real life story. 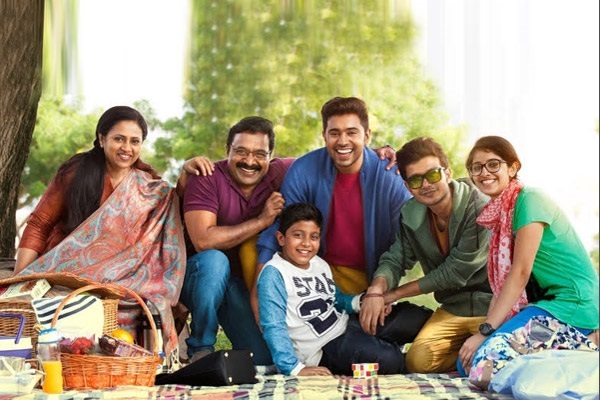 A very happy Keralite family of Jacob (Reji Panicker) settled in Dubai comprises of his wife Sherly (Lakshmy Ramakrishnan), Jerry (Nivin Pauly), Ammu, Abin and Chris. The family faces a sudden financial crisis because f Jacob’s blind faith on a friend. His financial position turns topsy-turvy and he has to abscond unable to meet the threat of a person who had loaned him heavily. Jerry, the eldest son and the courageous Sherly circumvent the situation with diligence and also be the help of providence. An absolute family drama with a high potential to turn into a mushy melodrama was handled with care by young Vineeth Srinivasan. The emotions and outbursts are there but within acceptable decibels. The three main players Reji Panciker, Lakshmi Ramakrishnan and Nivin Pauly characterization and execution need special commendation. It looks it is good time for Nivin Pauly and his choice and characters are well etched and he too exploits the chances with perfect understanding. The three young siblings are fantastic and adorable. The sibling love and affection also realistically portrayed. There is no dominant romantic segment for Jerry; a very brief one and we don’t feel for it. The music is average but luckily does not interfere with the development of the story line. Many of the scenes were captured in Dubai bringing the comfortable and glittering life there. ‘Jacobinte’ is a welcoming departure and the success of this movie should prompt again the emergence of engaging family dramas.